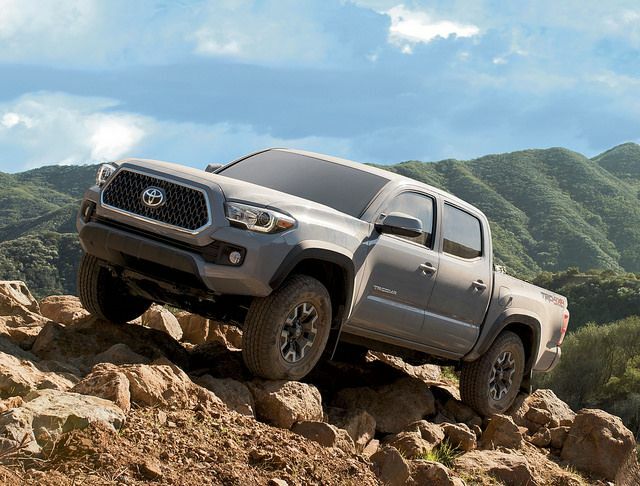 The new 2019 Toyota Tacoma, which is available at High River Toyota, features a range of exciting updates and includes the performance-enhanced Tacoma TRD Pro editions. Most Tacomas take their power from a 3.5-liter V6 that pumps out 278 horsepower and 265 lb-ft of torque, but for higher efficiency, you can go with the standard 2.7-litre four-cylinder engine, which is still good for 159 horsepower and 180 lb-ft of torque. The interior of the new Toyota Tacoma is upscale and comfortable. Interior tech is a highlight, with a standard display audio system with a 6.1-inch touch screen, a backup camera, an available GoPro mount, and more. But it’s not just entertainment tech that the 2019 Tacoma offers. Safety tech is also more advanced for the Tacoma than ever before. Every Tacoma model comes with Toyota Safety Sense P, which includes Lane Departure Alert, Dynamic Radar Cruise Control, Automatic High Beams, and the Pre-Collision System with Pedestrian Detection. Visit High River Toyota to learn more about the 2019 Tacoma. The 2019 Toyota Sienna has officially arrived at High River Toyota, and with sleek styling, a powerful engine, and a wide range of features, it definitely challenges the conventional opinion of the “boring minivan.” In fact, the Toyota Sienna was crafted for adventures. First and foremost, the Toyota Sienna prioritizes your family’s safety with standard Toyota Safety Sense P across the lineup. This suite of active safety features includes Lane Departure Alert with Steering Assist, Dynamic Radar Cruise Control, Automatic High Beams, and the Pre-Collision System with Pedestrian Detection. A 3.5-litre six-cylinder engine motivates the new Sienna, offering up 296 horsepower. When properly equipped, the 2019 Sienna can tow up to 1,585 kg. Standard features for the new Sienna include Apple CarPlay™ compatibility as part of the Entune 3.0 Audio system, as well as 40/20/40 split second-row seating for easy cargo management. Not a lot of cargo? Not a problem: The Toyota Sienna also works as a people hauler for large families, comfortably seating up to eight occupants. Other standard comfort and convenience features include rear privacy glass, steering wheel-mounted audio and voice recognition controls, three-zone independent climate control, front row captain’s seats, cruise control, and an outside temperature gauge. Visit High River Toyota to learn more about the adventure-ready 2019 Toyota Sienna. 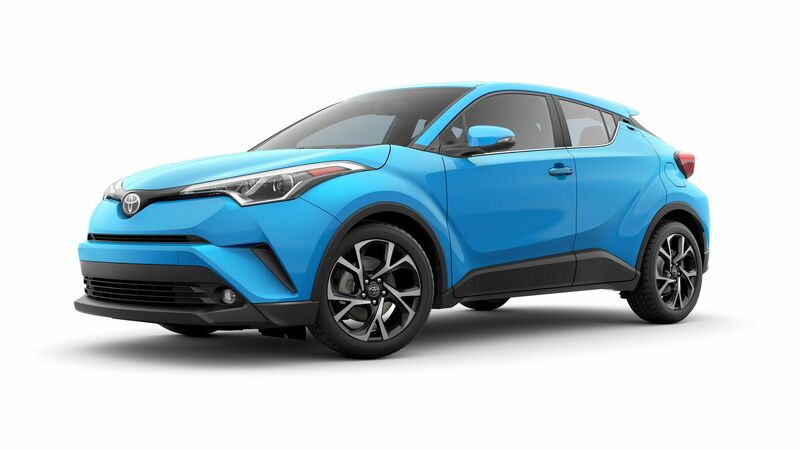 For 2019, the Toyota C-HR is offered with four option packages: Standard, XLE, XLE Premium, and Limited. The XLE, XLE Premium, and Limited Packages upgrade the infotainment system to Entune Audio 3.0. Plus. They also deliver a leather-wrapped steering wheel, heated front seats, and the Entune Safety Connect with Automatic Collision Notification, Stolen Vehicle Locator, Emergency Assistance button and Enhanced Roadside Assistance. The XLE Premium and Limited Packages feature Push Button Start, a Smart Key System, puddle lamps, power folding mirrors, and heated exterior mirrors along with safety features such as Lane Change Assist and Blind Spot Monitor with Rear Cross Traffic Alert. The Limited Package enhances the 2019 C-HR with ambient lighting, leather seat surfaces, front windshield de-icer, and rain sensing wipers. Visit High River Toyota to learn more about the 2019 Toyota C-HR. *Model shown is a 2019 Toyota C-HR, starting from MSRP of $23,675. MSRP does not include Freight & PDI of $1,815, Air Conditioning Charge of $100, license, insurance, registration, applicable taxes, levies, and fees. Prices and fees vary.